What Is the Serving Size for Hazelnuts? Hazelnuts, also known as filbert nuts or cobnuts, contribute a variety of healthy vitamins and minerals to your diet. 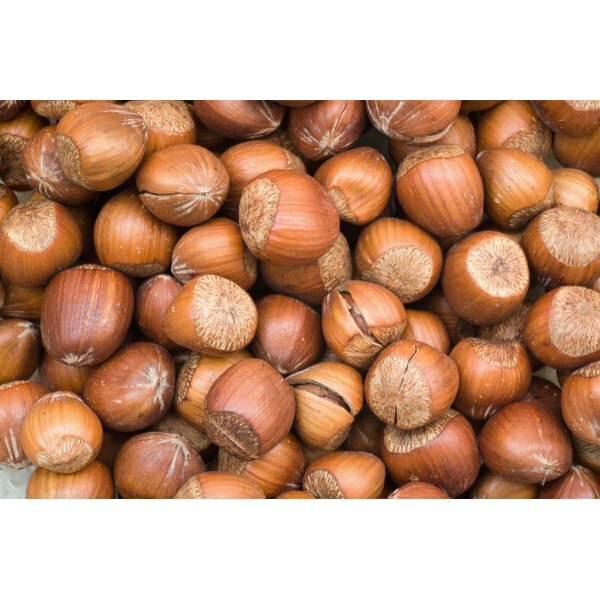 However, it’s critical to understand what a serving of hazelnuts is and how many servings you may safely consume each day – eating too many can contribute to excess weight gain. Including nuts such as hazelnuts in your diet can be a tricky thing in terms of the U.S. Department of Agriculture Food Pyramid – one serving counts toward the two to three protein servings you should consume each day, but they also count toward your daily allotment of fats since nuts are generally high in fat – 17.6 grams. A serving size of hazelnuts is approximately 1 ounce, or roughly 180 calories. This equates to a small handful of nuts. One serving size of hazelnuts is a good choice for boosting your fiber intake. You get 2.7 grams of fiber in each ounce of these nuts. If you are a man, you should eat 38 grams of fiber per day, and women need 25 grams. The fiber in a serving of hazelnuts contributes toward heart health – a study published in the November 2010 issue of “Current Atherosclerosis Reports” indicates that eating hazelnuts and other nuts reduces your risk of coronary heart disease and may lower high blood pressure. Eat a serving of hazelnuts, and you take in 1.6 milligrams of manganese. You need 1.8 to 2.3 milligrams of this mineral, depending on your gender, although you should consume more if you are pregnant or breastfeeding – 2 and 2.6 milligrams, respectively. A serving size of hazelnuts contributes toward your ability to heal wounds, either from surgery or an accident. Manganese helps activate an enzyme that helps encourage collagen production in the skin, which promotes the healing of lacerations and scrapes. Incorporate a serving of hazelnuts into your meal plan – these nuts are a source of vitamin E. One portion of hazelnuts provides 4.3 milligrams of vitamin E. Adults require 15 milligrams per day. Vitamin E allows your body to properly use vitamin K, so eat hazelnuts with vitamin K-rich foods such as spinach, liver or parsley to help your blood clot adequately. Evidence available in the May 2011 issue of “Seminars in Ophthalmology” correlates vitamin E consumption with a lower risk of age-related macular degeneration, so snack on a serving size of hazelnuts for your eye health.